I want to like this more than I did, largely for the friendship between Maria and Dawes, a relationship that in most films would have turned romantic. But when Bogart exits the film almost entirely for a lengthy stretch in the middle, this thing just about grinds to a halt and burns the goodwill it had previously earned. That said, there is some memorable dialogue, such as: "Is she an actress?" "No, she's a woman." Kind of pointless and dull like real life. Humphrey Bogart is always great and elevates every scene he is in, but, despite beautiful photography and setting, this film kind of drags in the middle and is long on drama, short on moments that actually hit. Viewed February 5, 2015. Gorgeous to look at and some of the dialogue is great, but it's also exhausting and unengaging. When it comes to movies about showbiz, it's clear that All About Eve is the way to go. Too long, too much drama, too little Bogart. While it's tempting to call this trite and dated, it's so uniquely charming that I can't do it. Bogart and Garner dominate but the entire supporting cast is wonderful in showing just what's needed from their characters, making Garner the center of the story even when she's not on screen. There's tons of narration yet it never feels jarring and if it weren't for the magnificent Cardiff colour cinematography this would be a classic Noir. Mankiewicz induces death by talking in this overlong, irresolutely cynical showbiz tragedy that remains opaque and lifeless while much drama unfolds. 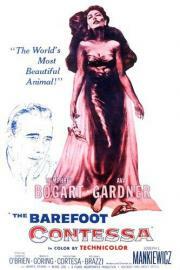 Bogart looks like roadkill, O'Brien won an Oscar for sweating, and Ava Gardner looks good in a dress. Talky, but more than occasionally amusing. Besides, Gardner is very good here and so is Bogart. Even Rozanno Brazzi gives a good performance. The first part, charting Gardner's success and building her relationship with father figure Bogart, is actually pretty good. But Bogie slips out around the halfway point and isn't around much until the end, and it's this long period that just seems to plod along, not establishing much or doing anything interesting with the characters. And for a movie that keeps reiterating how life is not like a movie script, the dialogue is awfully overwritten and the performances quite theatrical.